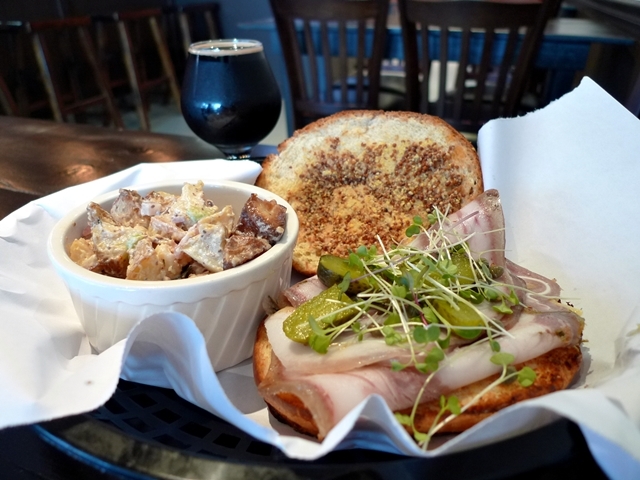 The new Sybarite Pig in Boca Raton looks like a craft beer joint upon entry, but as their slogan states, it’s also a place for craft grub— specifically meat boards and sandwiches. When I visited, there were nine protein-packed choices, including a number of housemade sausages served on pretzel buns (all the breads are baked fresh daily, onsite), but what caught my eye was the Porcetta di Testa (sic, $12). The porchetta was moist, fatty, and flavorful. Layered on brioche, a little of the crisp crackling that I normally expect with porchetta would have been a nice contrast to the soft bread. Still, this was a solid sandwich, with some microgreens adding freshness, and boosted in flavor by lemon capers and grain mustard. If you want options, Sybarite Pig offers an intriguing selection of side sauces for the sandwiches, including burnt miso, pickled fennel & plum relish, and aji amarillo. Each sandwich comes with a complimentary side. I chose duck fat roasted potato salad, though even better were the pickled beets in Greek yogurt that I sampled. You can round out your snacking with a sweet from the dessert list—and then there’s the eclectic collection of beer. The menu is ever-changing, international but with a commitment to a core group of Florida brews. I enjoyed a glass of Smoking Wood from The Bruery (non-sic), a porter brewed with a hefty amount of rye malt. Between beer and breaded meats, pigging out at the Pig will make you feel sybaritic indeed.